Yesterday was one of those rare Colorado fall days that actually makes you think of fall. Typically autumn lasts for a week, and then winter rears its snowy head. This fall has been temperamental, but seemingly more fall-esque. With a rainy day that never reached a high of 60 degrees, and an office autumn potluck to prepare for, I went searching for a delicious seasonal treat that was worth the time of year. Given my recent trip to the UK, I have been on a tea and scone kick, so I decided to make scones. Other than pumpkin, which is my automatic autumn go-to, apples are another perfect taste of fall. 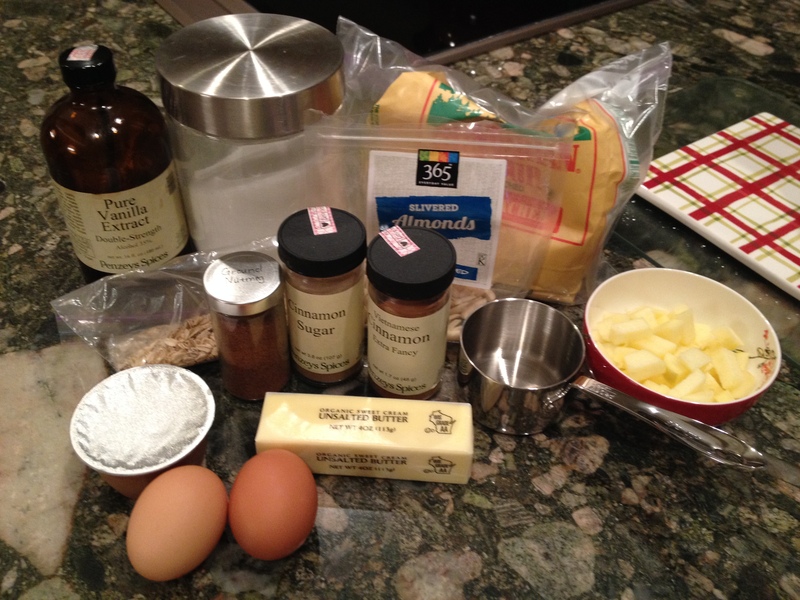 In my hunt for the perfect apple cinnamon scone, I stumbled upon one of my favorite baking resources, King Arthur Flour. They always have great recipes, ideas, and really wonderful products. I discovered an apple cinnamon scone recipe that I thought would be easy to edit to my tastes. I didn’t want to add the butterscotch chips, and had some oats and almonds lying around. After testing it out on my boss and coworker this morning, it has passed the taste-test. So here it is, my own Apple Cinnamon Oat Scones! Freeze the unbaked scones for 30 minutes before baking. 30 minutes in the freezer relaxes the gluten in the flour, which makes the scones more tender and allows them to rise higher. It also chills the fat, which will make the scones a bit flakier. Scones are best served warm. They’re delicious as is, but add butter and/or jam (or apple butter), if you like. To reheat room-temperature scones, place on a baking sheet, tent lightly with foil, and warm in a preheated 350°F oven for about 10 minutes. 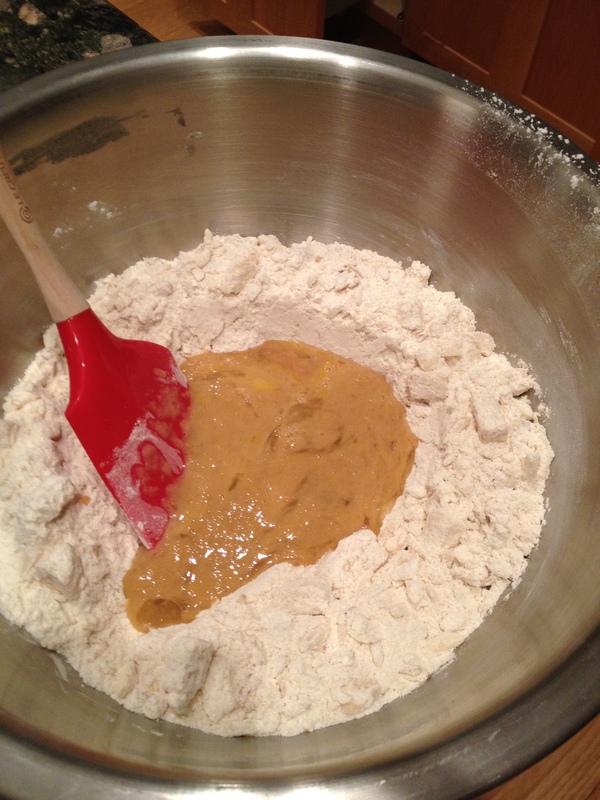 In a large mixing bowl, whisk together the flour, sugar, salt, baking powder, and spices. Work in the butter with a pastry cutter just until the mixture is unevenly crumbly and the butter is about the size of peas. Stir in the chopped apple, oats, and almonds. 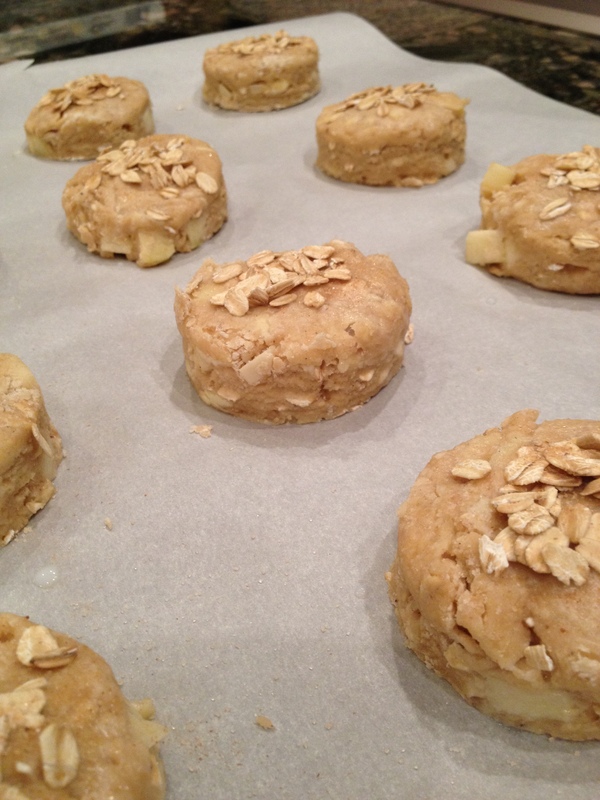 Incorporate the filling (apples, oats and almonds) with the dry ingredients. Make a well and pour in the wet ingredients, mixing until just combined. In a separate mixing bowl, whisk together the eggs, vanilla, and applesauce. Create a well in the middle of the dry ingredients and add the liquid ingredients to the dry ingredients and stir until all is moistened and holds together. Line a baking sheet with parchment; if you don’t have parchment, just use it without greasing it. Sprinkle a bit of flour atop the parchment or pan. Scrape the dough onto the floured parchment or pan, and form the dough in a round about 3/4″ thick. Using a small biscuit cutter, cut out the scones. Brush each circle with milk, and sprinkle with the oats and Cinnamon Sugar. Place evenly on the prepared pan, leaving an inch between each scone. For best texture and highest rise, place the pan of scones in the freezer for 30 minutes, uncovered. While the scones are chilling, preheat the oven to 425°F. Bake the scones for 18 to 20 minutes, or until they’re golden brown. 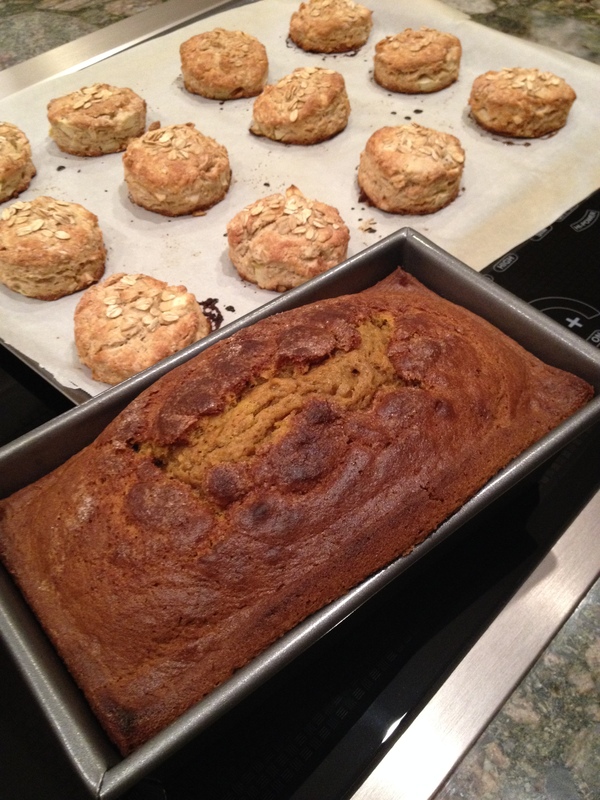 I may have also made pumpkin bread… I got fall baking happy! What are your favorite fall flavors and recipes? What’s your favorite thing to do on a crisp autumn day? What are you up to this weekend? 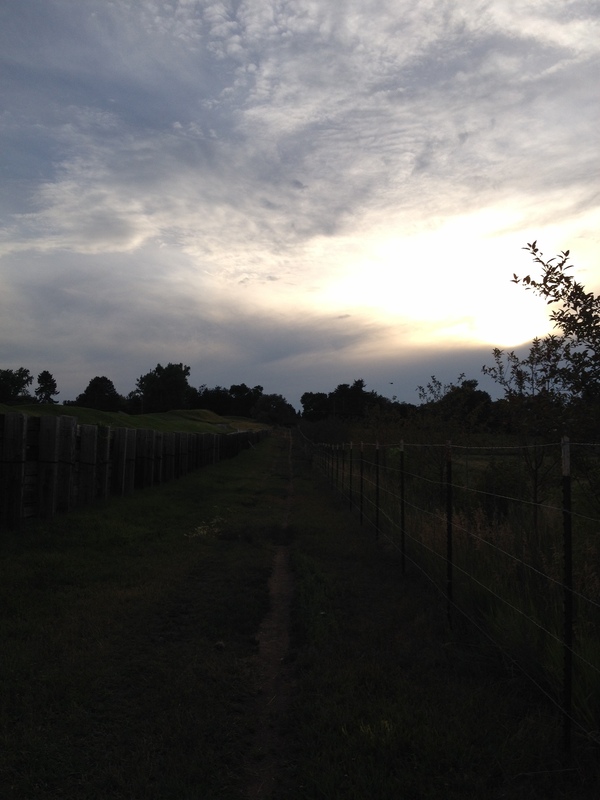 Gorgeous evening sky along the trail behind my neighborhood on Monday. This past weekend, as well as Monday evening, I ventured down an almost forgotten trail that originates steps from my front door. 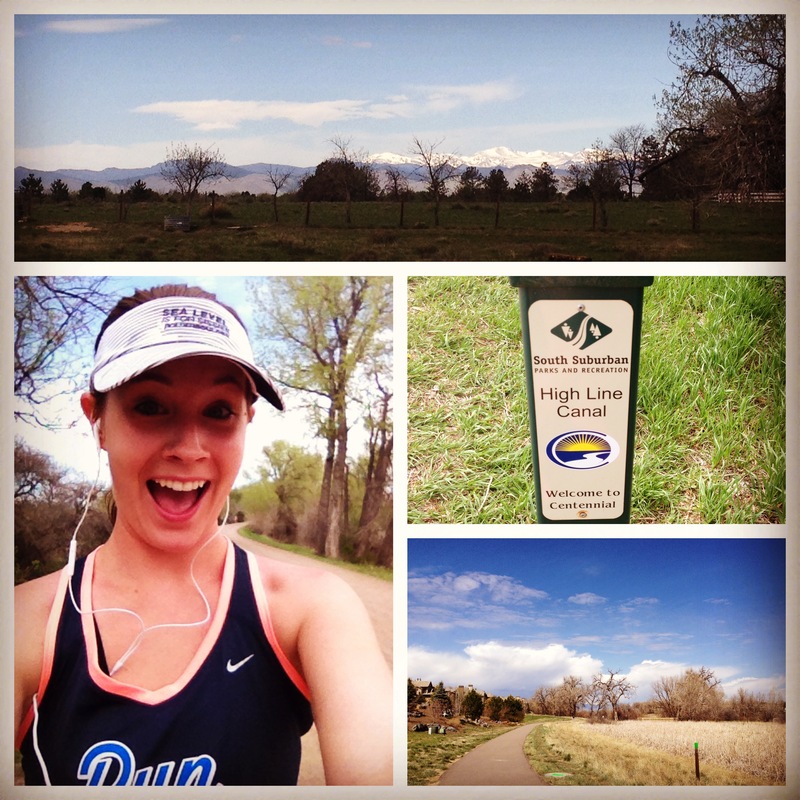 It’s an awesome trail tucked between neighborhoods, schools, and golf courses, and I finally realized that this same trail connects me to my favorite running trail in Denver: the Highline Canal trail. 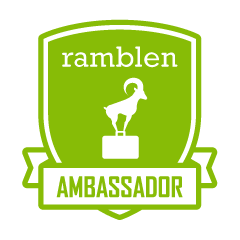 (You can learn more about the Highline Canal trail from Ramblen – they have an awesome review!) It took me over a year of living in my neighborhood to realize it, but at least I figured it out! The trail is shared by equestrians, runners, and cyclists, and wraps around the back of my neighborhood until is runs alongside a service road for a private school nearby. Finally it runs into a paved trail that follows much of the town I live in and eventually intersects the Highline Canal trail. I love the wildlife refuge area around this beautiful pond – so peaceful! going. The days this month have been hot, and for Colorado standards, humid (except most of this week in which temps dropped to the 60s and we had 36 straight hours of cloud cover and rain – weird!). I knew I had to get my run in early, and didn’t want to drive (the 5 minutes…) to my usual entry point to the Highline Canal. So I set off at about 8:15am, and after my usual 2 mile turnaround point, I ventured on. Low and behold, just a few hundred feet beyond that point, the trail runs right through the Highline Canal trail. Who knew? Well, obviously not me, but given the many other people on the trail that morning, I am one of few who were completely oblivious… Oh well! I had already decided to get a 10K in that morning, but was so excited to experience this whole other section of the Highline Canal trail that looked very different than the portion I was used to. 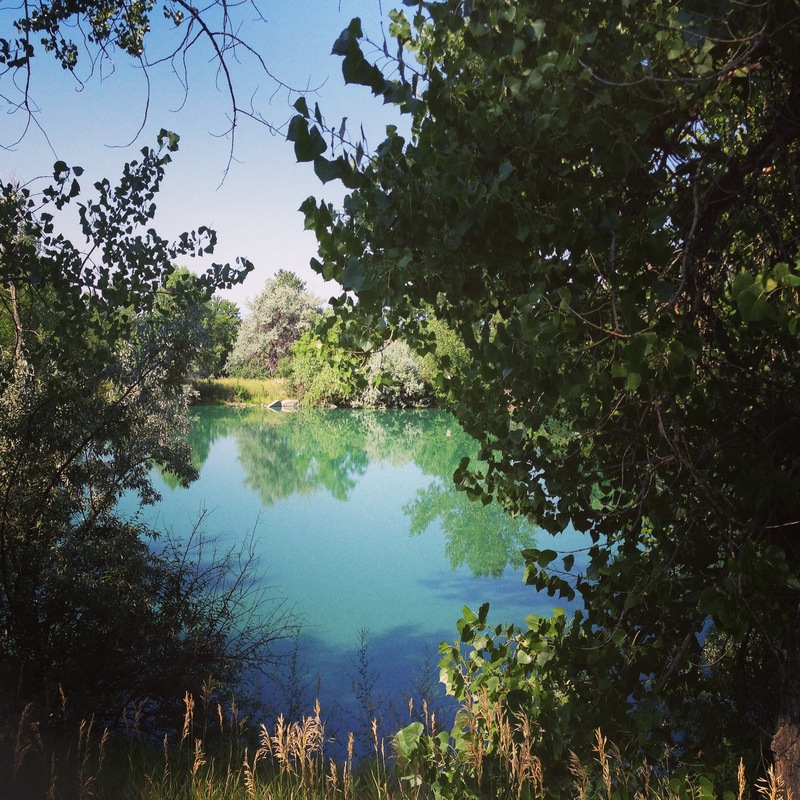 I passed by a wildlife refuge area with an amazingly clear blue pond. Beyond that were fields and farms, nestled away but incredibly close to my neighborhood. This section wraps around the other edge of the private school I pass on my little neighborhood trail, and rolling hills seem to just keep stretching out beyond that. It’s a little slice of heaven. By the time I hit over 3 miles and turned back towards home, I was in an amazing mood. It was a great run – so good in fact I ran a little over four miles Monday evening to be able to get some time on this newfound piece of my favorite trail. Perfectly convenient trail that will allow me to get miles in easily, without having to drive! Enough with the healthy stuff, let’s get on to the delicious recipe that I just have to share with you! 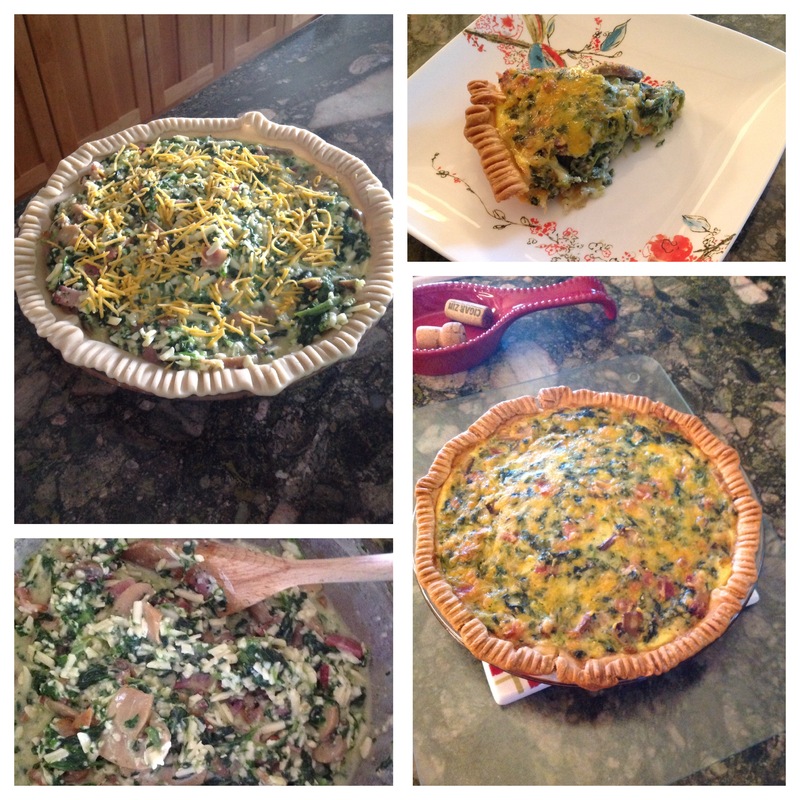 I got this recipe find originally from my friend Colleen back in Washington D.C., but found a modified version recently thanks to Sweet Eats and Crafts (great foodie blog!). This recipe is not a health-conscious recipe, but instead a delectably easy, perfectly chewy cookie recipe. 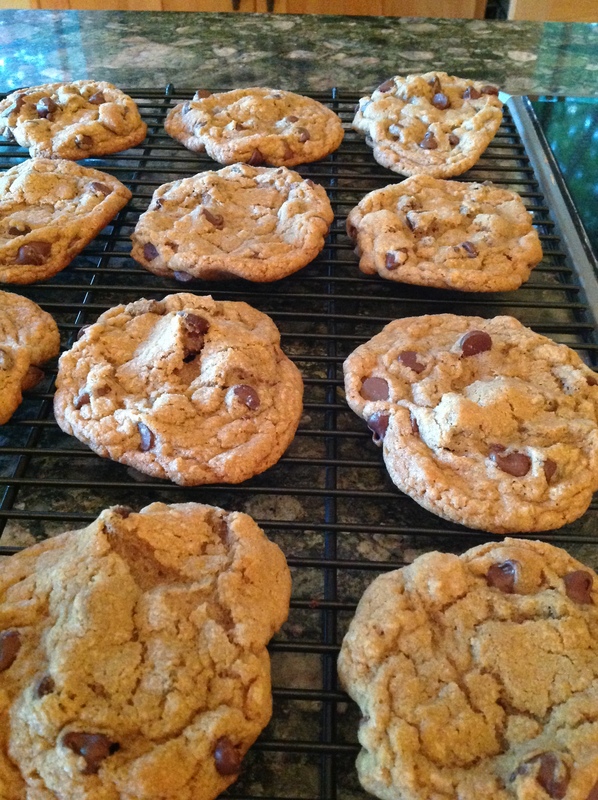 I am a huge fan of soft chewy chocolate chip cookies, particularly right out of the oven, and this recipe fulfills that desire. It’s such a straight forward recipe that I made them in about 30 minutes, including prep and clean up. Awesome! The key is butter flavored shortening – it makes all the difference in the world. 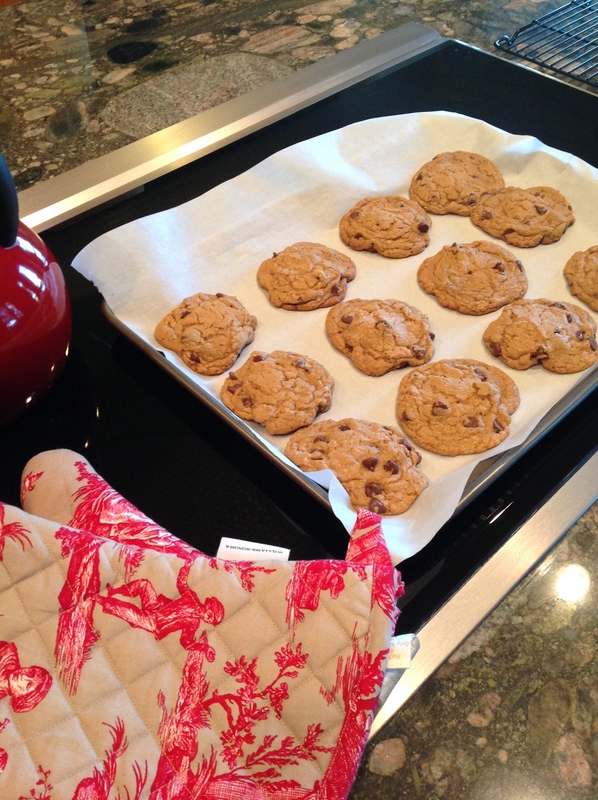 Without further ado, Sweet Eats and Crafts’ Soft Baked Chocolate Chip Cookies! Not too many ingredients, and absolutely delish! Preheat the oven to 375º F. In a large bowl, cream together the shortening, brown sugar, milk, and vanilla with a hand-held mixer on medium speed until well-blended. Once creamy, add the egg and blend again until incorporated. In a small bowl, stir the flour, salt, and baking soda, and then add to the creamed mixture using a spatula to fold the ingredients into the batter. Add the chocolate chips and mix until evenly distributed. Using a cookie-scoop or spoon, drop 2 rounded tablespoons of the dough on pan lined with parchment paper, about 2-3 inches apart. Bake for 8-10 minutes. If you make a slightly larger cookie, they may need to bake for 10-12 minutes. The cookies may appear to be slightly under-baked, but this is because they are much softer. Allow them to cool on the pan for about 10 minutes before transferring them to a cooling rack. Make sure to store the cookies in an airtight container to maintain freshness. Enjoy! Definitely let them cool first so they don’t fall apart when transferring them… it’s hard to wait. Who doesn’t love a great chocolate chip cookie? 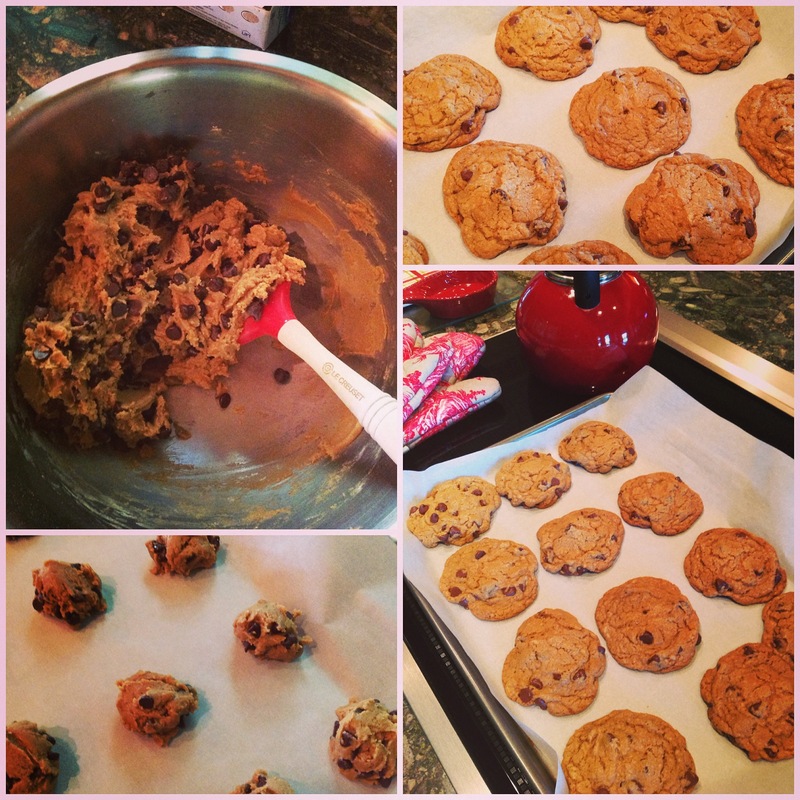 What is your secret to the perfect chocolate chip cookie? Do have any great trails surrounding you? Where do you run on weeknights when there’s less time to commit? I have been on a bit of a baking and cooking kick as of late, and I think it’s due mainly to this bizarre weather that Colorado has experienced during the past few weeks. This cold snap may be getting to me – I refuse to think that it actually snowed on Sunday and Monday. Luckily everything melted off yesterday, and it’s climbing into the 60s today (okay, it’s going be 60 degrees, semantics…). But given this odd shift in the weather, I have had more time inside, planning meals and finding some good new recipes and revisiting great old ones. 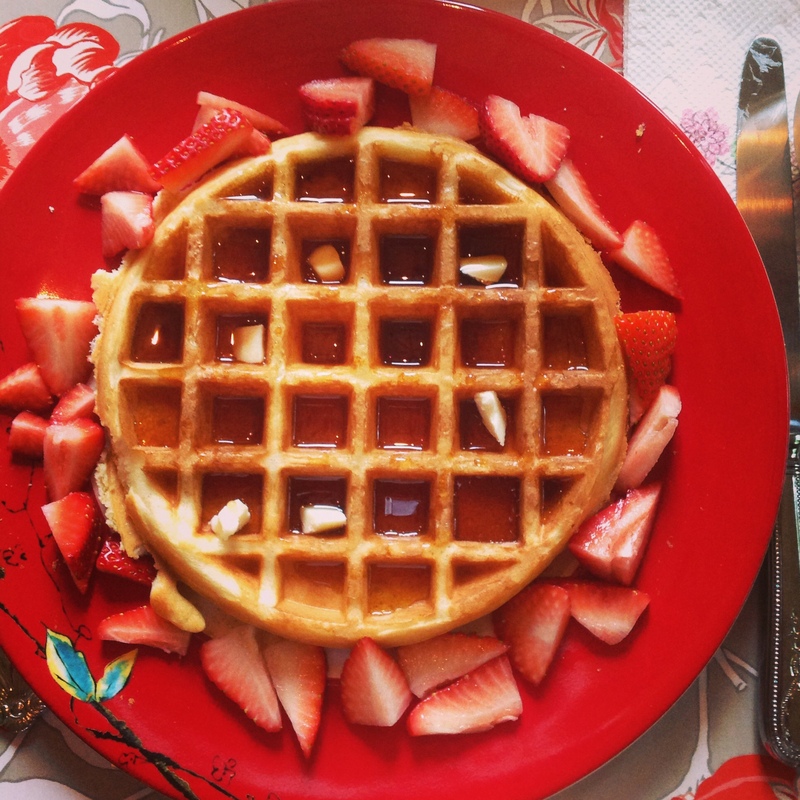 Homemade waffles with strawberries and maple syrup. I am one lucky puppy mommy! Sunday was Mother’s Day, but given my newfound role as a puppy mom, the hubs decided to rise early and prepare waffles with strawberries. It was the perfect way to start the day. We spent much of it playing with our pup, going to the gym (thanks a lot May snowstorm! ), catching up on our favorite shows (“Game of Thrones” and “Mad Men” really make Sunday nights amazing), and concocting cocktails and making a lovely fish dinner. Robbie grilled (in the snow!) halibut with a Cuban rub and I prepared my all-time favorite salmon recipe, grilled salmon with a lime butter sauce. We prepared sweet potato fries (with a drizzle of honey and a sprinkling of sea salt) as a side. So good, I tell you, so good. I had sent the hubs a recipe earlier in the week for a drink I wanted to try. 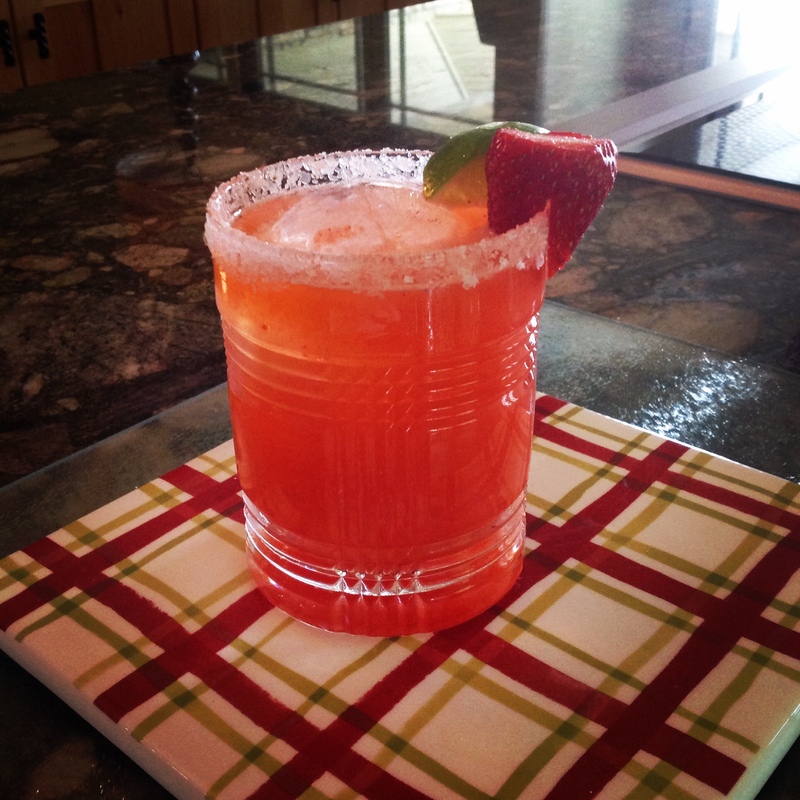 I found a recipe for a fresh strawberry margarita on the Anthropologie blog, and decided this would be my beverage for Puppy Mom day, regardless of the snow. It’s definitely worth it, not too sweet, and full of fresh ingredients. I learned early on that fresh orange juice makes a world of difference in margaritas, and that is proven true in this awesome libation. Such a tasty treat on a cold snowy day! Combine one pound of hulled strawberries and the juice of two oranges (preferably Valencia oranges) in a blender. Blend until very smooth and strain through a fine mesh sieve or cheesecloth. Store the puree in a tightly-lidded jar in the refrigerator. If you only want to make enough puree for one drink, combine ¼ pound of strawberries with the juice of half an orange. This should equal the 2 ounces needed for the cocktail. First, prepare your glassware: With a slice of lime, wet the rim and dip into a plate of sugar (the recipe calls for salt, but it made the drink a bit too savory, so next time I will make it with sugar), and fill the glass with ice. Then, in a cocktail shaker, combine the strawberry puree, tequila, Cointreau and lime juice. Add ice and shake vigorously. Strain into the salt-rimmed glasses and serve with a lime wedge and a fresh strawberry with the stem removed. If you need additional sweetness, add a touch of simple syrup or agave. Drink up and enjoy! 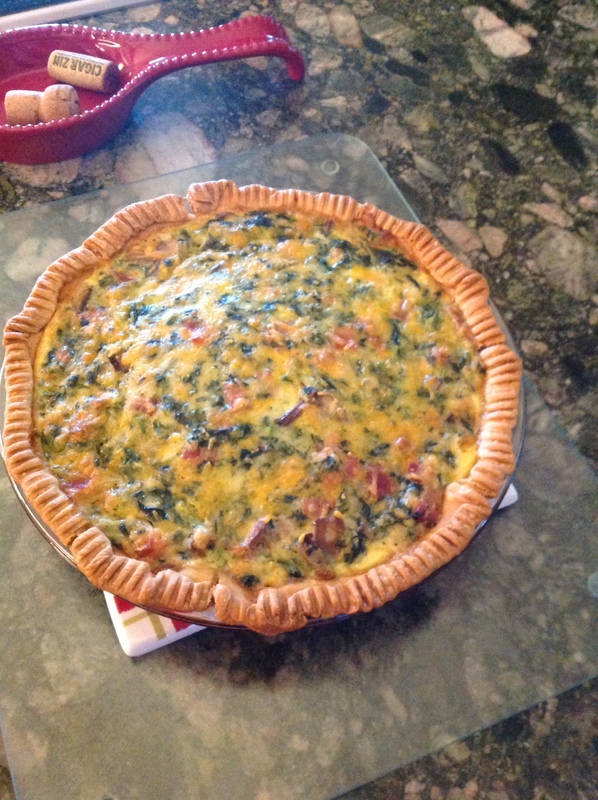 This week I made my tried and true spinach and bacon quiche, which is always a favorite given the prospect of leftovers. It doesn’t involve too many ingredients, can be used as a base for other fillers, and always turns out perfectly. I initially took the recipe from Kraft, but I tweaked it to mix up the cheese and add sautéed mushrooms for additional flavor. I know you’ll like it! Easy to make, but easier to eat! Heat the oven to 350°F. Line a 9-inch pie plate with the pie crust and flute or fork the edges. Toss the cheese with flour in medium bowl. Add remaining ingredients and mix until fully incorporated. Pour the mixture into the pie crust and disperse evenly. Sprinkle with additional cheese if desired. Bake for one hour or until knife inserted in the center comes out clean. Serve for breakfast, brunch or dinner. Enjoy! Combine the flour, salt, and sugar in a large bowl. Using a pastry cutter, fork or your fingers, cut the butter into the dry ingredients until it’s in pea-size pieces that are slightly yellow in color, about 4 to 5 minutes. Add 4 tablespoons of the ice water and mix just until the dough comes together. 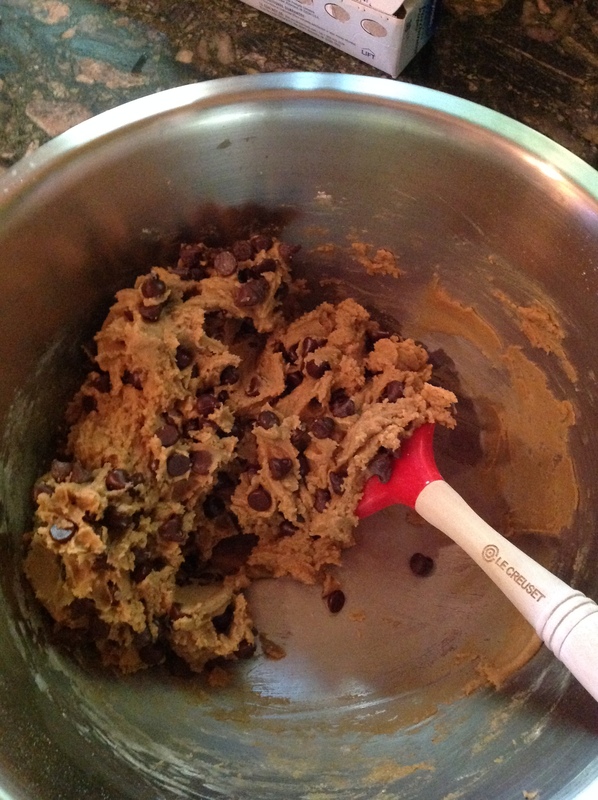 Only add the last tablespoon of ice water if necessary, but don’t overwork the dough or it’ll become tough. Shape the dough into a flat disk, cover it in plastic wrap, and refrigerate for at least 30 minutes, then use it in the pie or tart recipe of your choice. You can also freeze the disks for up to two months for future use. Place in the refrigeration prior to using to allow the dough to defrost slightly. What are your go to recipes? Any fun alternatives for margarita mix-ins? What did you do for Mother’s Day? 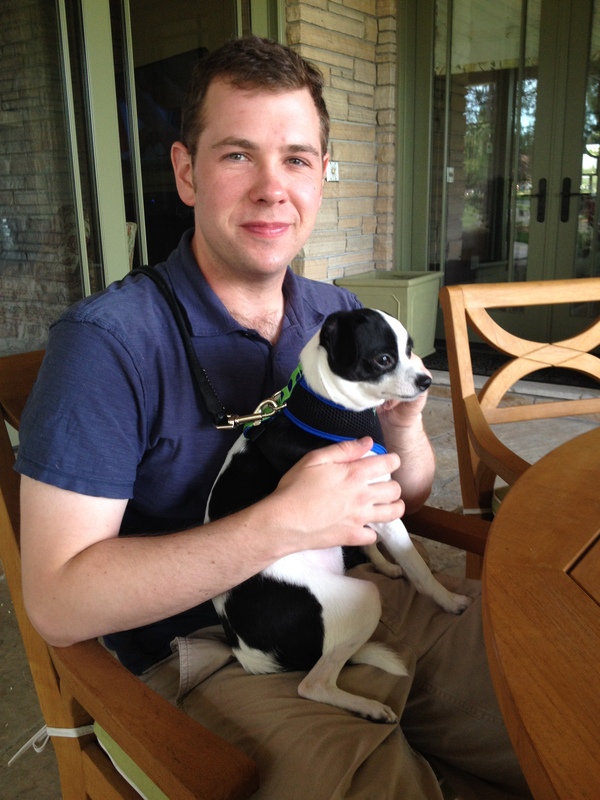 Am I crazy for celebrating Puppy Mommy Day – my pup is my fur-child after all? This week has been a hit the ground running kind of week. At work, students are entering finals week, so there is a lot of tension and nervous energy. Thankfully I have used this as an excuse to decompress when I get home. What does that mean? Exercise and cooking! Oh, how I love the elliptical! I returned to the gym this week, instead of running outside, due to some evening storms hitting the Denver area, and rediscovered my love for the elliptical. Over this past winter, using the elliptical really strengthened my legs, and I feel a noticeable difference now when I run. I admit I had my doubts at first. When my hubby first convinced me to give it a go, I thought my legs were on fire and that I would never walk again. I kid you not. I was in so much pain at work the next day. To say I was a little peeved at the hubs would be a vast understatement. The elliptical allows you to maintain athleticism and fitness without the harsh impact to your joints that you would get from running. 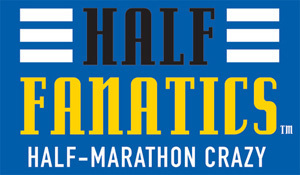 It’s a great complement to running, but so much easier on the knees, hips, ankles, etc. Studies have shown that the workout you get from an elliptical is highly similar to what you’d receive from running on a treadmill, but again, better for those joints! The elliptical works your quads in a way that running, walking, and cycling does not. For me, this was a major weakness prior to using the elliptical, and now I can feel the difference. My legs are stronger, particularly my quads. 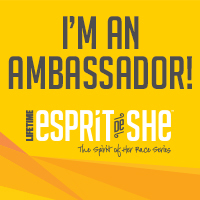 My legs don’t really tire when I run, and that’s been a phenomenal change. Using the elliptical helps to target other weak muscle areas, like your glutes (and boy do I love me some glute exercises… thus my adoration of Michele Rogers), hamstrings, and hip flexors. So this was a surprise to me, but could explain a slight shift in my stride: your stride actually increases when using an elliptical, which maximizes your workout. I just hope this translates to running. I use elliptical machines that require arm motion, which actually helps to incorporate the upper body and core into the overall workout. By engaging the arms, you get a great workout in one single machine. I do aspire to have arms like Jennifer Anniston or Cameron Diaz, so this makes me very happy. 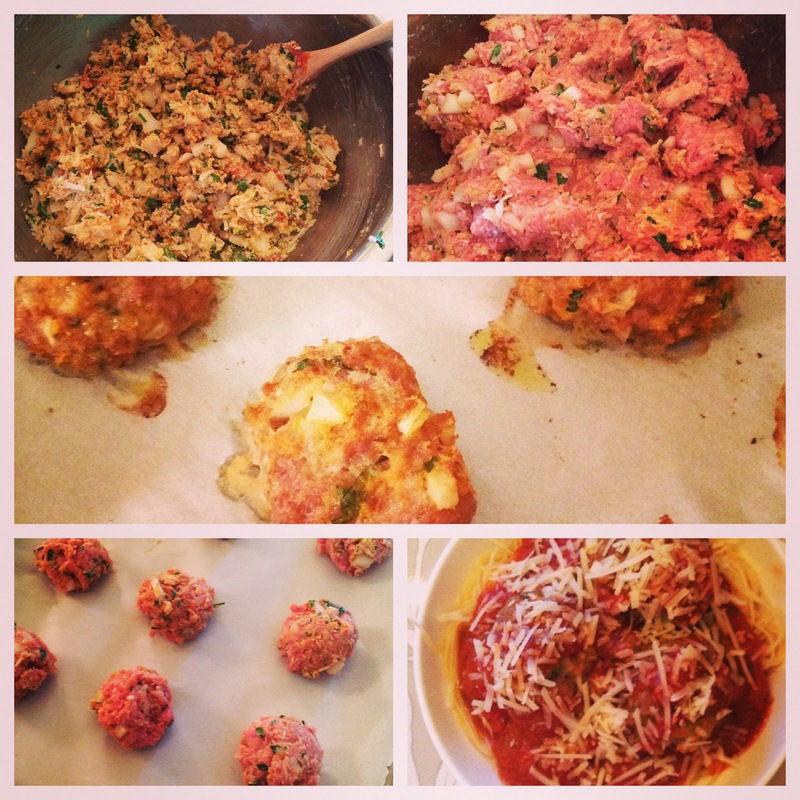 Besides reconnecting with my love for the elliptical, I also tried a fun new recipe for turkey meatballs! 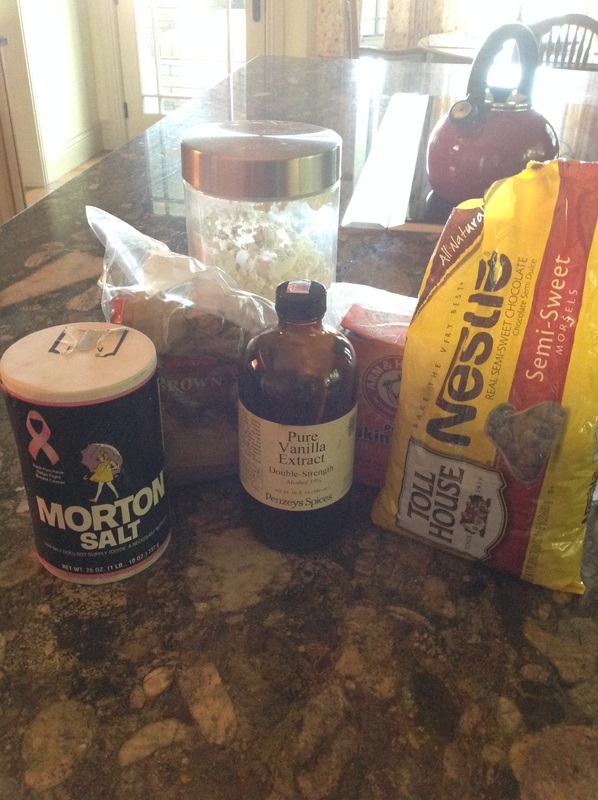 Again, I stole this recipe idea from my friend Justine, our gracious host for the Nike Women’s Half Marathon. She made these for us the night prior to the race and I’ve been dying to make them ever since. It’s a recipe from Giada De Laurentiis, and I have always loved her cooking. Her Spicy Baked Italian Macaroni is ridiculously good. I like to think of this meatball recipe as the kitchen sink turkey meatballs, it’s got just about everything in it! They are worth it, though, because they’re flavorful, moist, and light. I definitely recommend giving them a try! These meatballs are worth the effort. You can always freeze the extras! Perfectly portioned and a great addition to pasta night. 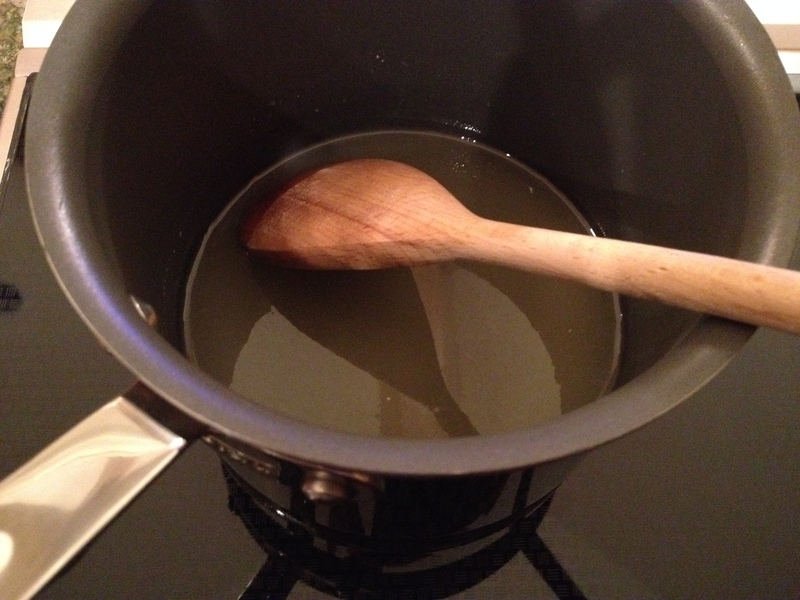 wooden spoon, stir to blend the ingredients. Add the ground turkey to this mixture. Using fingers, gently mix all the ingredients until thoroughly combined. Using a 1-ounce ice cream scoop, form the meat mixture into 1 1/2-inch balls (22 to 24 meatballs). 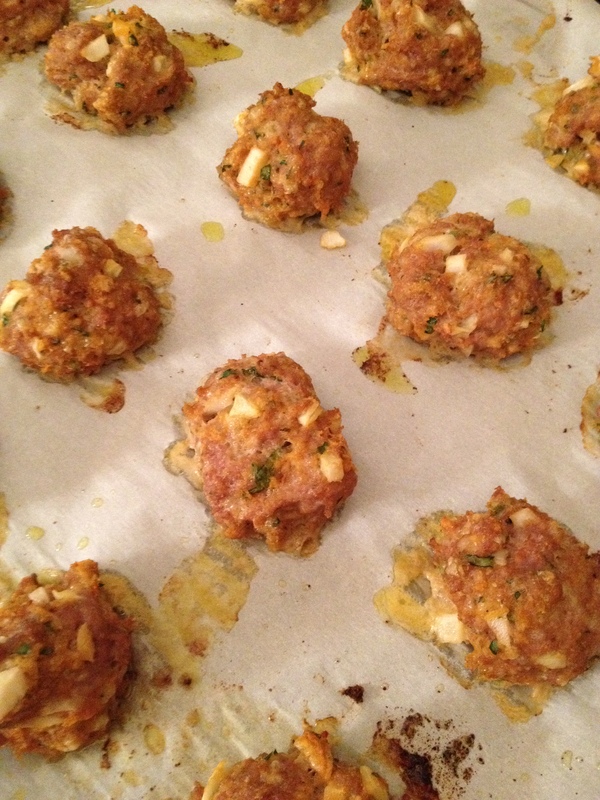 Place the meatballs on a heavy nonstick baking sheet, spacing apart. Drizzle with olive oil and bake until cooked through, 15 minutes. Serve with your preferred pasta (I made Angel Hair) and sauce (for pre-made sauce, I really like the San Marzano Pasta Sauce), and top with the extra grated Parmesan. Enjoy! These meatballs were so delicious, and because we actually used about 2.5 total pounds of turkey meat, we made about 30 meatballs. Looks like meatball subs are on the menu tonight! 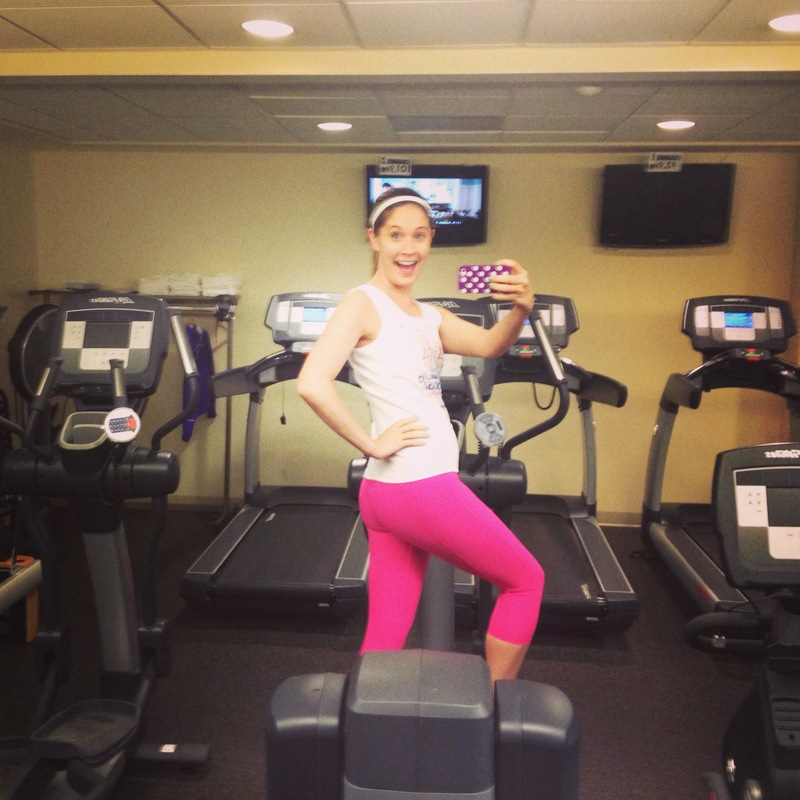 What are your thoughts on using the elliptical – yay or nay? Any inspired dishes on the menu recently? How do you balance your exercise routine? 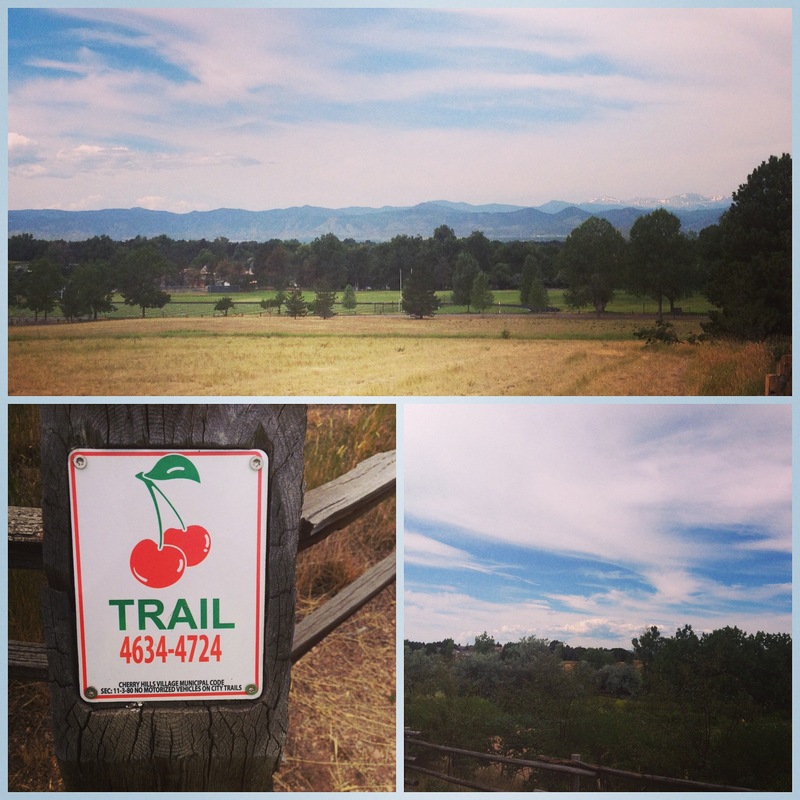 Gorgeous weekend for the High Line Canal trail – my new favorite! summer for the season. Both Saturday and Sunday were heavenly, hovering in the low 80’s, full of sunshine and light breezes, and ideal outdoor days. The hubs and I got two great runs in along the High Line Canal trail (he’s back in the running game after a 3 month battle with runner’s knee, so I am extremely excited), and spent the rest of our time cleaning up our back patio and planting our potted herb garden. What did we plant, you may be asking? My absolute herb garden staples: sweet basil, sweet mint, rosemary, lavender, lemon thyme, and sage. These are herbs I use so often, both in cooking and in cocktails (well maybe not lemon thyme in cocktails, but everything else, absolutely!). We also planted a strawberry plant. My sister-in-law planted one last summer and it did so well in the Colorado weather I thought I would give it a go! The other thing to keep in mind is that I pot everything. I like to change it up each year, and some herbs do not make it through the winter months here. Furthermore, I refuse to plant mint in the ground because it will spread like wildfire and it’s nearly impossible to get rid of. This allows me to monitor what I have and how much watering I need to do, and it’s so manageable. It’s finally mojito season. Did I mention my hubby is a novice mixologist? After all our hard work planting, cleaning off patio furniture, hosing the entire patio down, and removing leaves and fallen blossoms, our outdoor area was usable again! We spent Sunday evening grilling – I prepared salmon fillets with lime butter sauce and the hubs made a delicious sirloin – making cocktails (blackberry mojitos, yum! 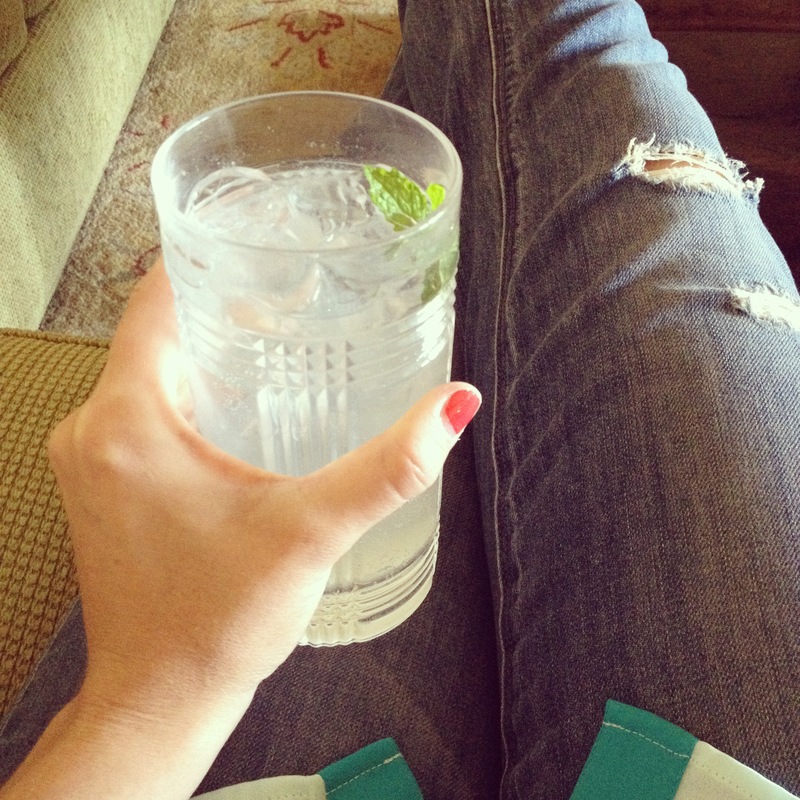 It was Kentucky Derby weekend, we had to have mint-inspired cocktails afterall), and baking! 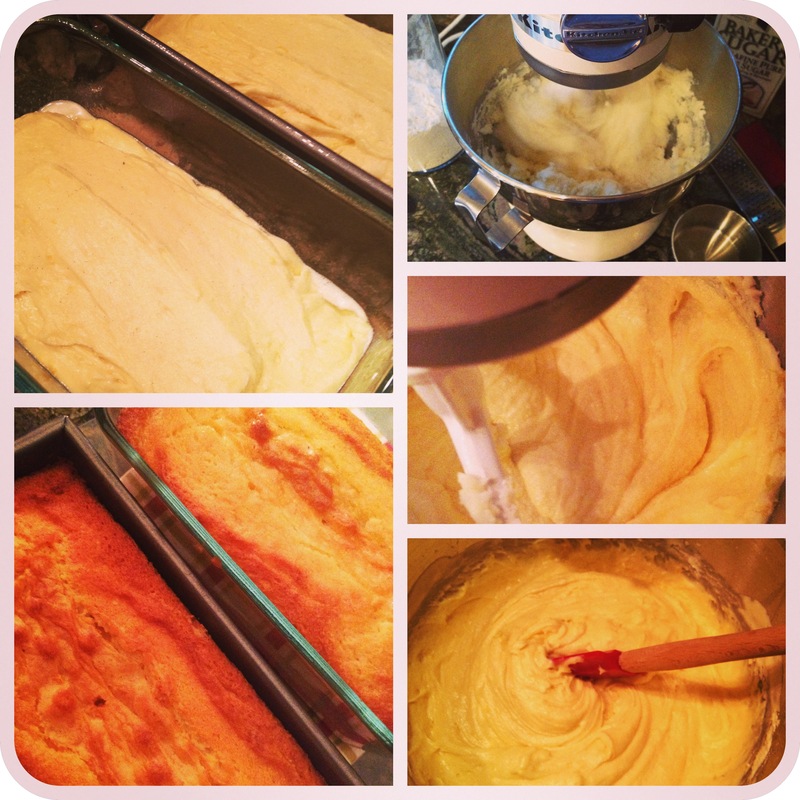 My friend Justine, who so graciously hosted my gaggle of girlfriends the weekend prior for the Nike Women’s Half Marathon in DC, found a delightful recipe for Cake Batter Blondies. She attempted to explain the odd connection she has with the creator of this amazing recipe, but I will not attempt to relay that here. Thanks to Sally’s Baking Addiction blog (and now cookbook! ), we’ve got a favorite new blondie recipe. The hubs and Rocco loving our clean and amazing patio! 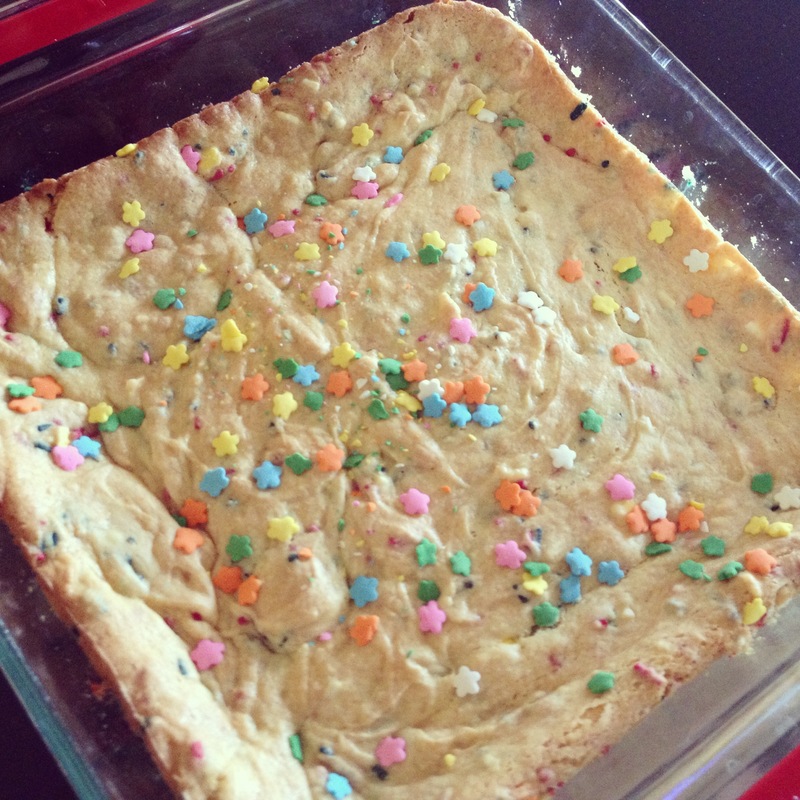 The hubs loves blondies, so I try to surprise him with new twists on this delectable classic. His mom used to make blondies for him as a child, and it has become his comfort dessert. She shared her recipe with me while he and I were still dating, and it was literally titled “Robbie’s Blondies.” It’s a sacred recipe to be sure. Switching it up, however, is always a fun way to rediscover his favorite treat. He and I both adore cake batter (almost) anything, so this recipe is the perfect combination of awesome. Plus, it’s super easy to make! I will not promise any health value, but enjoyment, most definitely. I am in LOVE with these blondies, and they’re so easy! Preheat the oven to 350F degrees. Spray 11×7 baking pan with nonstick spray (I realized I do not own a 11×7 baking pan, so I used a 8×8 and a 6×4 baking dish separately, so they weren’t as dense). Combine the first four ingredients in a large bowl, adding the milk slowly. You want the cake batter to be as dense & thick as possible. 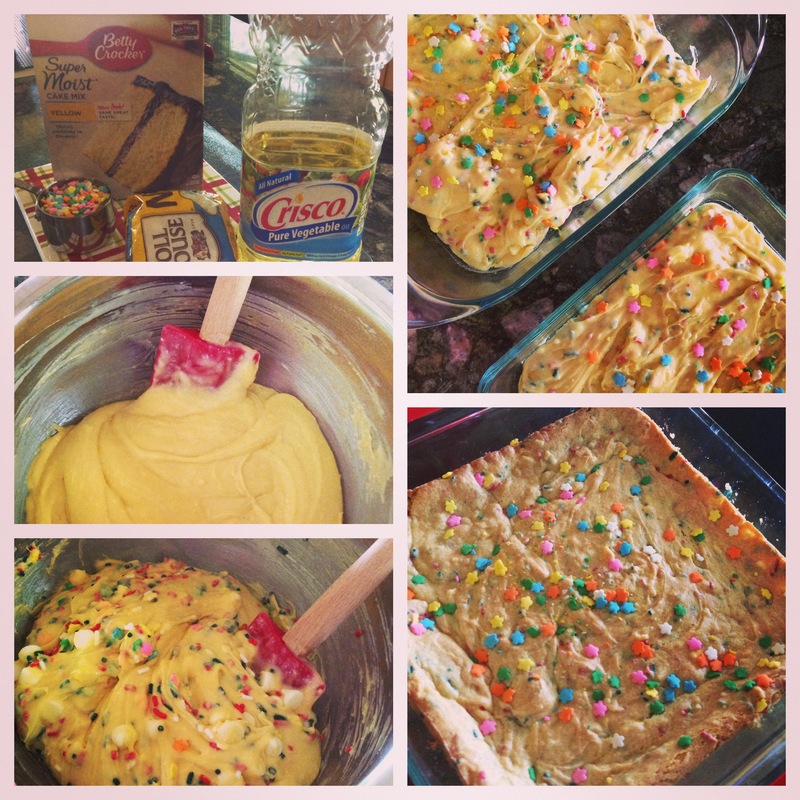 Mix in the sprinkles and white chocolate chips. Pour into prepared baking pan, sprinkle a few more sprinkles on top, and bake for 25-30 minutes until edges are just turning brown (at high altitude 25-26 minutes is recommended). Allow to cool for at least 30 minutes so the center sets, before cutting into squares. Keep in mind they will not appear to be fully done as the center will be gooey and fudgy. This is the ideal consistency, however, so do not cut them until they’ve cooled! Sally also notes not to use black sprinkles – it will turn the batter black before you bake… and that wouldn’t look so pretty! What have you been up to recently? Anyone else loving the ability to bask in the outdoors? What fun twists do you have for your baking favorites? While my folks are up in Boulder for the week (boy am I jealous) I have to get back to reality for just a bit. That means work and, dare I say it, other responsibilities. I serve on the executive board for my sorority’s Denver area alumnae association, and tonight is our annual meeting. This is the day we get numerous members together, along with prospective new members, discuss the current status of the group and decide on any changes we want to make for the year ahead. We also bring items to provide for this year’s Panhellenic (the overarching body of traditional sorority chapters) philanthropy, Newborns in Need. It’s a bit like a “baby shower,” except we don’t know who the mothers are. Ladies bring diapers, clothing, toys and other necessities. It helps that it’s in April, so the theme totally works. Now that is all well and good, but the best part about the meeting is the potluck. You have amazing women from all generations, walks of life, and coming from all parts of the country coming together with some of their favorite dishes. It’s always bound to be delectable. I, being the novice baker that I am (or claim to be), signed up to bring dessert. I was tired of heavy, wintery desserts, so I looked in my fridge and noticed I had a large quantity of lemons. Something citrusy was in order, so as per usual, I sought out advice from my all-time fav, Ina Garten, aka the Barefoot Contessa. My selection is by no means health conscious, but boy is it delicious. Besides, it’s fun to splurge every now and then (it’s all about moderation folks). So I decided to make Ina Garten’s incredibly heavenly Lemon Cake. The glaze really is the icing on top! Overall it took about 30-40 minutes, and then just a few additional steps once the cakes were cooled. Preheat the oven to 350º F. Grease and flour, or use Bak-Klene ZT Nonstick Baking Spray (works like a dream! ), 2 (8 ½ by 4 ¼ by 2 ½ -inch) loaf pans. You may also line the bottom with parchment paper, if desired. Cream the butter and 2 cups of sugar in the bowl of an electric mixer fitted with the paddle attachment, until light and fluffy, about 5 minutes. With the mixer on medium speed, add the eggs, 1 at a time, and the lemon zest. 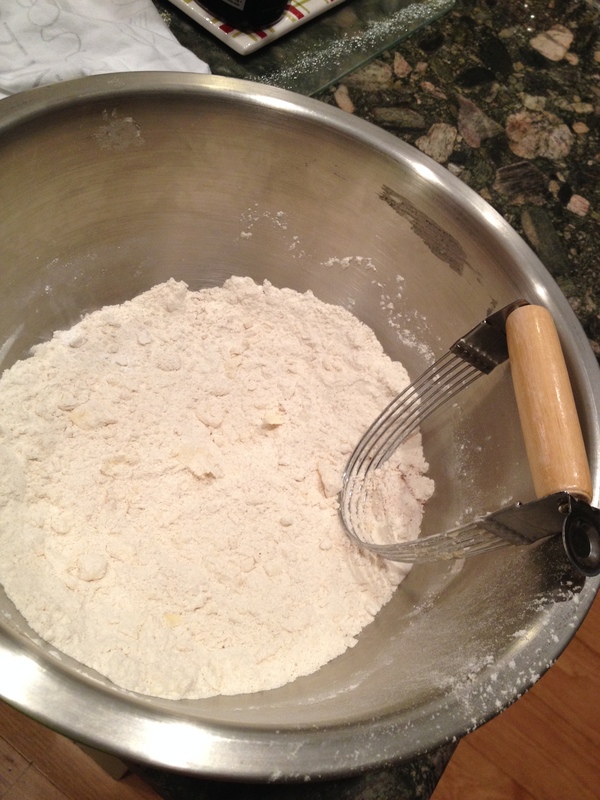 Combine the flour, baking powder, baking soda, and salt in a bowl. 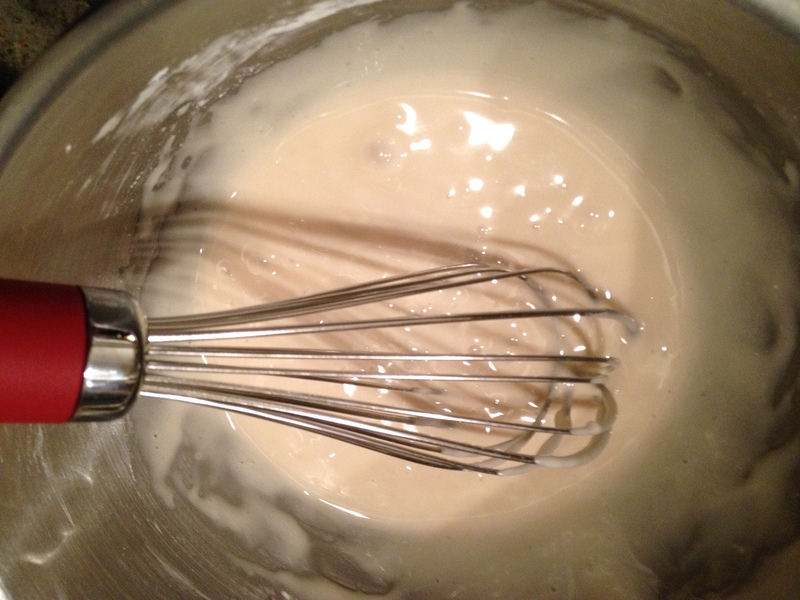 In another bowl, combine ¼ cup of the lemon juice, the buttermilk/heavy cream, and vanilla. 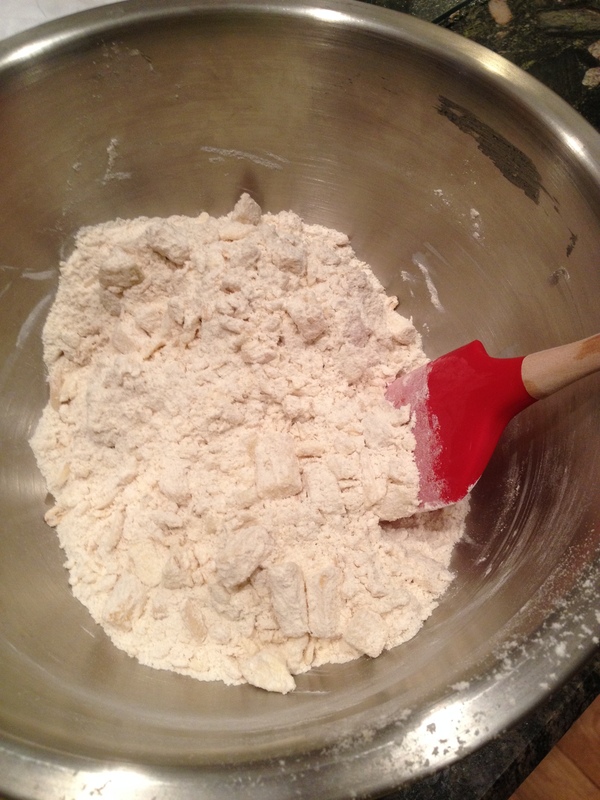 Add the flour and milk mixtures alternately to the batter, beginning and ending with the flour. Divide the batter evenly between the pans, smooth the tops, and bake for 45 minutes to 1 hour, until a cake tester comes out clean. Combine ½ cup sugar with ½ cup lemon juice in a small saucepan and cook over low heat until the sugar dissolves. When the cakes are done, allow them to cool for 10 minutes. Remove the cakes from the pans and set them on a rack set over a tray or sheet pan; spoon the lemon simple syrup over them (because I needed to transport mine, I kept them in the pans and drizzled the syrup and glaze over them while in the pan). Allow the cakes to cool completely. 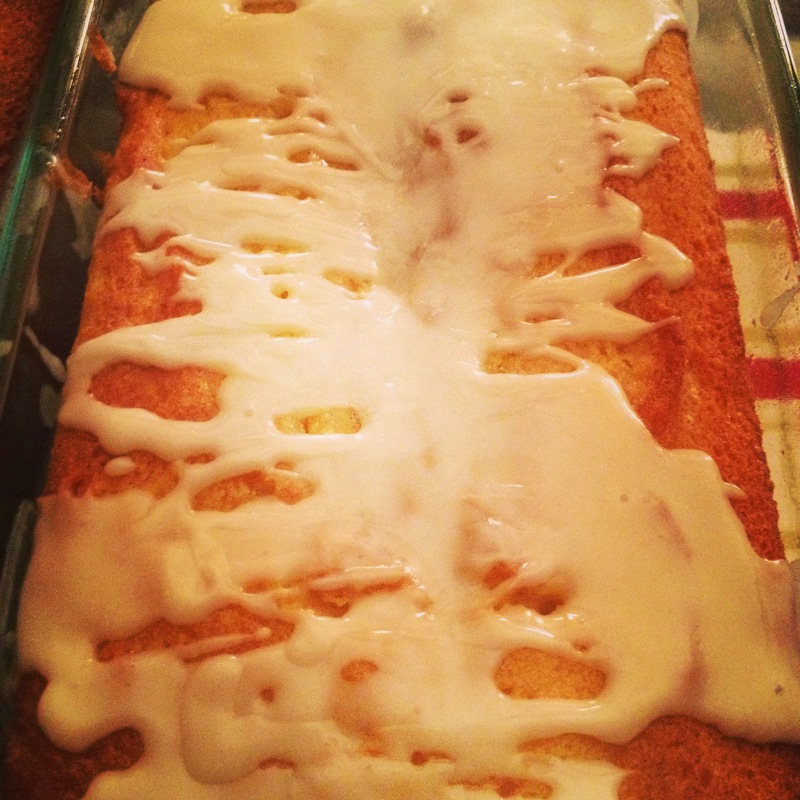 The lemon simple syrup soaks into the cakes, making them moist and delicious! For the glaze, combine the confectioners’ sugar and the lemon juice in a bowl, mixing with a wire whisk until smooth. Pour over the tops of the cakes and allow the glaze to drizzle down the sides. Enjoy! What are your favorite lemony recipes? Who inspires you when it’s time to work wonders in the kitchen? What is your go-to when it comes to baking? I have been feeling more adventurous and motivated recently, in all things: work, domestic enterprises (aka cooking and decorating), finding new places to go and things to do. I think it’s a combination of this beautiful springtime weather (this time last year it was snowing on a weekly basis) and the excitement of my parents’ visit this weekend (I CANNOT WAIT!). Last week I was inspired by a recipe posted by Chocolate Covered Race Medals. She made delightful looking arugula gnocchi. Hello, yum much? So I thought I would mix it up a bit and test out arugula and basil pesto with gnocchi. I am a wee bit obsessed with pesto, and the hubs and I are huge fans of arugula. It’s got a lemony peppery taste that just brightens up any dish. After hunting for a good recipe, I found this one courtesy of Emeril Lagasse (BAM!). I added some sautéed mushrooms and my favorite Parmesan Pesto Sprinkle from Savory Spice Shop (just in case it wasn’t pesto-y enough), but otherwise followed the recipe this time. Luckily we made so much pesto that we have extra left over. Needless to say there will be a pesto pizza in our future, as in tomorrow night’s dinner. 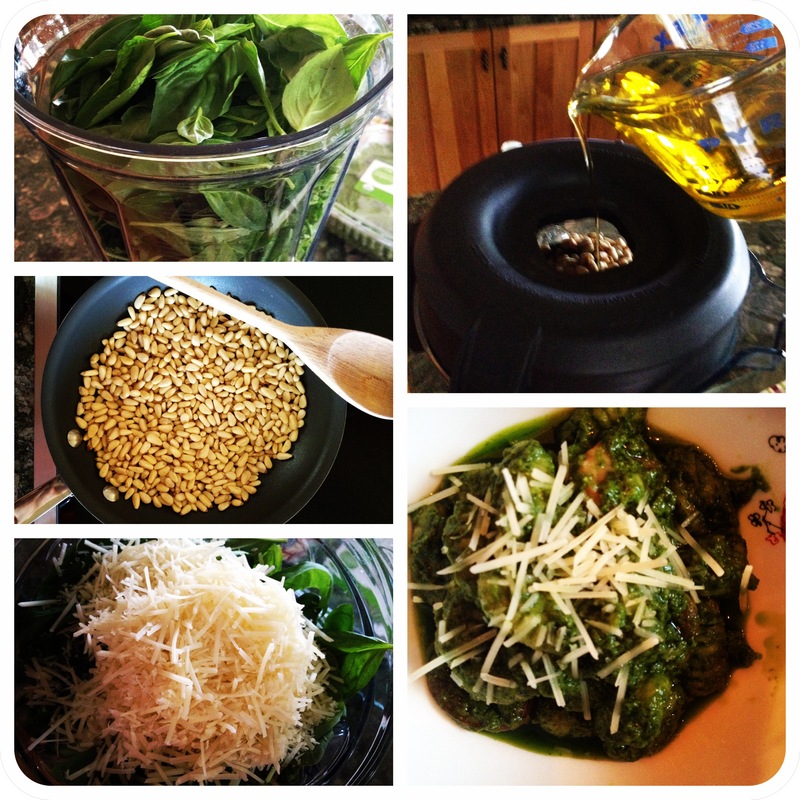 In the bowl of a food processor (or Vitamix), combine arugula, basil, toasted pine nuts, Parmesan, and garlic. With the motor running, add 1 cup olive oil in a slow stream until emulsified. Season with salt, pepper, and Parmesan Pesto Sprinkle to taste. Sautee the mushrooms in a dash of olive oil in a separate pan. Once sautéed, keep them in the pan, as you will use this to combine the mushrooms with gnocchi and pesto. In a large pot of boiling salted water, add the gnocchi. Cook until they rise to the surface (just a few minutes for fresh pasta, but check package instructions.) Drain well, reserving ¼ cup of the pasta water. In the pan with the mushrooms, combine pesto with remaining ¼ cup of olive oil and reserved pasta water. Pesto should become a sauce-like consistency. Add gnocchi and toss to combine. Serve warm and garnish with extra parmesan cheese. Enjoy! Delicious meal, and enough for leftover creations – that’s the best! It was easy-peasy and so delicious. I am so excited for tomorrow’s dinner. Imagine it: pesto pizza with grilled chicken, mushrooms, sliced tomatoes and fresh mozzarella. Is it tomorrow night yet? 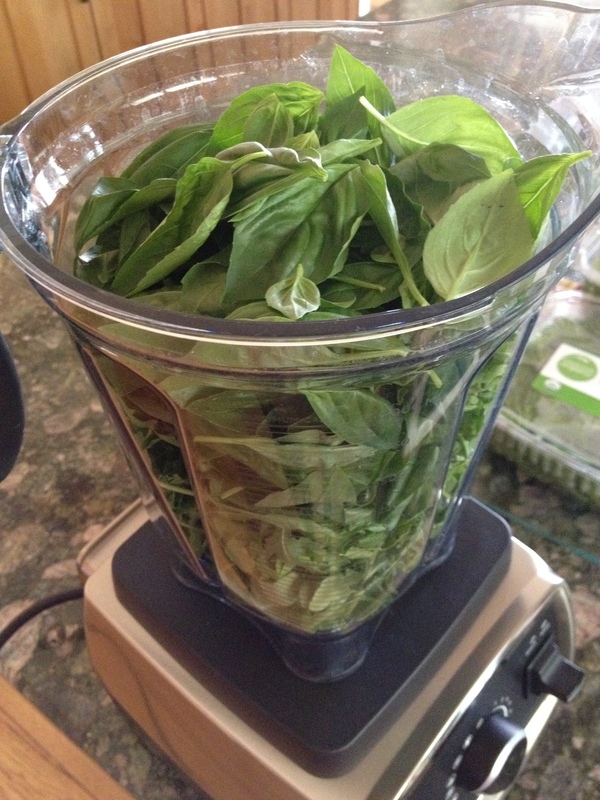 Don’t you just love pesto – what’s your favorite surprise ingredient? Anything fun on the menu this week?